The Saskatchewan Indian Institute of Technologies is busy gearing up for its 40th anniversary celebration later this month. The institution, which is governed by First Nations leaders from all over Saskatchewan, has come a long way since it first opened its doors in 1976. SIIT now serves approximately 2,400 students annually at its three campuses in Regina, Saskatoon and Prince Albert. The college offers a host of certificate and diploma programs in a variety of areas including trades and industrial, business, information technology, health and community studies and adult basic education. SIIT also operates the Saskatchewan Aviation Learning Centre at the Saskatoon airport. Along with the University of Saskatchewan, University of Regina and Saskatchewan Polytechnic, it is one of four educational institutions in the province with credit granting authority. 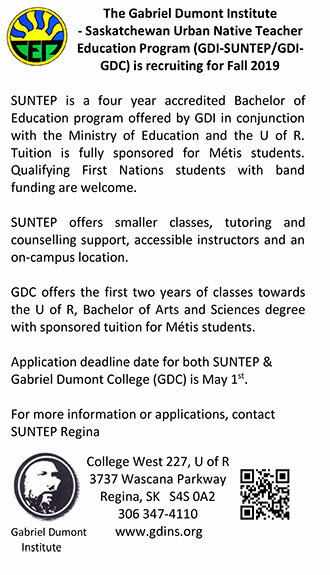 It is estimated that about 93 per cent of SIIT students are of Aboriginal ancestry and 75 per cent of these students complete their chosen programs or continue their education. Two out of every three students are over the age of 25 and one in three has dependents. Since 2010, SIIT has represented students from 175 First Nations all over Canada. Riel Bellegarde is the president of the Saskatchewan Indian Institute of Technologies. He says things really turned the corner for the institution when the province passed the Saskatchewan Indian Institute of Technologies Act in 2000. The legislation recognized SIIT as an accredited granting institution enabling students to transfer credits to other post-secondary institutions and have their diplomas and certificates recognized by both Aboriginal and non-Aboriginal employers at the provincial level. Bellegarde also credits an increased focus on trades programs to address Saskatchewan’s changing economy and the creation of the career centres as factors that have contributed to SIIT’s success in recent years. Twenty-three-year old Jesse Weist is a graduate of SIIT’s carpentry program. In February 2015 and at the age of 22, he became the Joint Training Commission’s youngest journeyperson carpenter to achieve red seal certification. Weist, who is currently working as a lead hand for Coram Construction in the building of the new stadium in Regina, says one thing he really enjoyed about his SIIT experience was the smaller class sizes the institution offers. “There’s 12 people in each class per semester so it is pretty close one on one teaching,” he says. Thirty-year-old Glenda Watson is a graduate of SIIT’s community addictions program who later went on to complete both a bachelor of health sciences and masters of education, with a focus on counseling and psychology, at Lethbridge University. She currently works for the Alberta Department of Health helping people who struggle with addictions within the prison system. Watson, who is a member of the Ahtahkakoop Cree Nation, says her years spent at SIIT gave her a cultural understanding of how addictions affect Indigenous people. Nevertheless, in spite of SIIT’s success, there remains a significant educational and employment gap for Indigenous people in the province. Riel Bellegarde says he believes it will be a continued effort to mentor and offer various supports to students who may have fallen through the cracks at other institutions that will play perhaps the largest role in closing this gap. The SIIT 40th anniversary gala event takes place April 21 at Prairieland Park in Saskatoon. The keynote speaker will be renowned Canadian comedian Rick Mercer.